I believe in a team approach to medicine. My patients commit to the process and together we work towards a common goal. Dr. Garlick is board certified by the American Board of Orthopaedic Surgery and dual fellowship trained in adult reconstruction and sports medicine. He completed his medical training at the University of South Florida in Tampa and his residency in Newark, New Jersey. Dr. Garlick has advanced training in all areas of sports and joint replacement, including complex cartilage restoration, ligament reconstruction and joint resurfacing and replacement. He is trained in robotic surgery, navigation, arthroscopy, and minimally invasive surgery for knee replacement. He is currently one of the only surgeons in the region performing outpatient surgery center knee replacement. Although he has been trained in all areas of sports and joint reconstruction, his keen interest lies in knee joint preservation and patients with knee arthritis. After suffering from severe knee pain for several years, I finally decided to do something about it. My older brother had a partial knee replacement about a year before mine and strongly recommended Dr. Grant Garlick. Dr. Garlick performed a partial knee replacement on my right leg. After a very short recovery time, I was back to walking every day with my wife, riding a bike, hunting, fishing and enjoying a pain-free life. It’s been a little over a year since my surgery and I can’t thank Dr. Garlick and his staff enough for the excellent care they provided. I have had both knees replaced. The right knee is 14 weeks old and the left is less than six. With therapy, the recovery has been quick. The return to normal living with little to no pain is less than three weeks away! He is high energy and attentive. He explained his use of equipment and the reason for using visionary knee prosthetic. I had a partial knee replacement a year ago. I can not say enough about the care and compassion of Dr. Garlick and his staff. I can honestly say that he gave my life back to me. I was in so much pain that I did not want to do anything. Now, a year later, I am doing great! I’m not good at writing reviews and I am not a fan of doctors due to prior bad experiences, but after dealing with Dr. Garlick and his great staff, I felt the need to write this review. Thank you for allowing me to see that not all doctors are bad. I was never pushed or rushed into surgery making me feel like I was just another dollar sign. Dr. Garlick and his staff feel like family and I am so grateful for professionalism, compassion and friendship. I had a right knee partial replacement and I am feeling great! Thank you so much for everything! I would highly recommend Dr. Garlick and company. You won’t regret it! One of the best orthopedic doctors ever. Very nice! Dr. Garlick has treated my advanced osteoarthritis in both knees for several years, mainly with shots. He recently performed a total knee replacement on my left knee, which I am in physical therapy for. After one month, the repaired left knee is already functioning to the extent that I can walk fairly normally and return to basic activities. Surgery went very well and pain management was effective! Dr. Garlick is without peer. I’ve had other orthopedic surgeries and physicians, none of which come close to his knowledge, individualized treatment and procedures. I would recommend that friends and family travel here to Tampa for a knee replacement. If I need surgery on the other knee, Dr. Garlick is the only surgeon I would even consider. From the office staff to Dr. Garlick, I cannot tell you how nice and caring these people are. I had both my knees replaced by Dr. Garlick. The first one I had done in October and the second one was a week before Christmas. I am out and about doing my normal everyday things. He is the best, he listens and gives you his opinions. If he had to, I am sure he could perform the surgery in his sleep. From Kaleigh, Kaitlyn, Elizabeth to Dr. Garlick, I thank you all for taking good care of me. Dr. Garlick and his staff are very professional, down to earth and easy to talk to. He answered all my questions and made me feel at ease about my surgery. He did an excellent job repairing my patella tendon. I highly recommend him to anyone needing orthopedic surgery. He is the BEST at what he does. I am grateful that I had him as my doctor. Dr. Garlick was thorough and explained the underlying condition well. Lindsey went beyond what was expected and took time to personally communicate and follow up with me. This has been the best experience since being treated for the pain in my knee. I have had a full knee replacement and now I am able to walk, lose weight and start enjoying my life again. Dr. Garlick is wonderful and thorough. I was fully prepared for what to expect. His techniques and surgical abilities are the reason for my success as a patient. I cannot say enough about him and his entire staff. It has been a pleasure getting to know all of them. The physical therapy is key to your recovery! Even when I come in with pain, I’m always taken care of in a warm and heartfelt way!! I was nervous about having fluid drawn, but they made it a painless experience! Arriving at Florida Orthopaedic Institute for injections can always be stressful. Yolanda Neal greeted me in such a nice way and was very professional. I really appreciated the positive way she dealt with me. Shayits Wilcher also is especially kind, and always greets you with a smile! I always feel comfortable on visits to see Dr Garlick. Arriving at FOI for injections can always be stressful. Yolanda Neal greeted me in such a nice way and was very professional. I really appreciated the positive way she dealt with me. Shayits Wilcher is especially kind and always greets you with a smile! I always feel comfortable on my visits when I see Dr Garlick and his team. After having three surgeons tell me that I needed a total knee replacement and they couldn’t help me because I was too young, I made the two hour trip to see Dr. Garlick. For the first time, a cortisone shot worked because he used an ultrasound machine. He eventually did do a partial knee replacement, which was the perfect solution. The Surgery Center was amazing, and the operation was a piece of cake. He is the only orthopaedic doctor I will ever see. Thank you Dr. Garlick! Five stars all the way! Great doctor with a great staff. I have been seeing Dr. Garlick for several years now and I am very happy with the care that I have received. I have a long history of severe OA in my knees. I had multiple injections, procedures and therapies all which were ultimately unsuccessful. Then, I found Dr. Garlick. He is very knowledgeable regarding current therapies and treatment options. He is also very straightforward when presenting options. He listens and answers questions completely. Dr. Garlick is friendly, compassionate and empathetic. I had a total knee replacement two weeks ago with excellent results. Thank you, Dr. Garlick. I switched from the very popular Dr. Lyons to Dr. Garlick. He is wonderful. I broke my right knee cap in many pieces. He managed to salvage a few of those pieces and now it is good as new. Love him! Dr. Garlick saw me twice and after the second visit the pain is completely gone. Thank you so much! For over 3 years I was in such pain with my right knee that it was so hard to walk, stand or sit without pain in my knee and leg. After being referred to the Florida Orthopaedic Institute, I scheduled a consulting with Dr. Grant Garlick to discuss my options. It was determined that I needed a partial knee replacement and scheduled surgery on June 30, 2014 where the procedure was performed at the Florida Hospital of Carrollwood. The care at the hospital was exceptional from the pre-op until the day I left the hospital. A followed the therapy to the letter for weeks following the surgery and I am proud to say that I am back to the gym and able to walk, stand and work-out without pain. I just completed my annual exam with Dr. Garlick and my knee looks good and feels great. 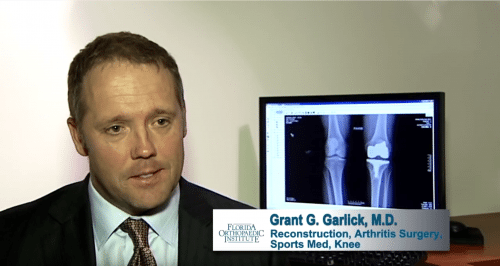 I highly recommend Dr. Garlick and the Florida Orthopaedic Institute to anyone who is seeking relief of knee pain and to get back to your normal activities and enjoying life. Dr. Garlick, his nurse and staff have been wonderful throughout a four week period of treatment on my right knee. I was almost ready for a knee replacement and had been researching stem cell therapy for the knee after three friends and neighbors had the treatment with another doctor who was not an orthopedic surgeon. My research led me to Dr. Garlick, an orthopedic surgeon who also uses stem cell therapy along with the PRP (platelet rich plasma) injections. My treatment consisted of harvesting my stem cells and injecting them into the knee followed by 3 injections of PRP which was completed last week. Although no doctor can guarantee the long term results as this is experimental, my knee is feeling better and the pain almost gone just 3 days after the final injection. Dr. Garlick, has been so gentle and understanding and the injections were almost pain free. I will and have recommended Dr. Garlick to many friends and family. He is a great doctor and has a wonderful bedside manner. On June 28, 2016, I had a truly awesome experience at the Dale Mabry location. It was my first time at this location and the outstanding customer service began as soon as I set inside the building. The soothing decor and waterfall walls immediately calmed me. I was greeted as soon as I walked in and asked if I needed help. I was directed to Dr. Garlick’s location. The employees in Dr. Garlick’s reception area were professional with a bit of humor, helpful and fast. They were courteous and patience when i forgot to go take my x-ray. They made me feel like they have been knowing me for years. Each area I was treated with respect and world class customer service. I left there with a smile on my face and a great experience in my soul. Not even the needle pain in my knee could distract from the awesome treatment. I work for a Huge federal agency where exceptional customer service is our Number one goal, therefore, I recognize and appreciate it when I receive it. Dr. Garlick diagnosed my knee arthritis condition after detailed examinations, X-rays and MRI. He advised that my knees are deteriorated due to osteoarthritis with the left being much worse. He advised two options: total knee replacement (80% probability of pain relief) and stem cell therapy (70% probability). After more detailed discussion, I decided for stem cell therapy. I had the bone marrow aspiration from the right side of my pelvis on February 5. After centrifugation to concentrate the cells, the concentrate was injected in my left knee. I felt minor discomfort during the procedure but no pain. This was followed with three injections of platelet rich plasma, extracted from my own blood, spaced during three subsequent weeks. The PRP concentrate was similarly injected into my left knee. The third injection was administered on March 3. Although the full effect of the treatment will take about 10 to 12 weeks, I have already felt relief and I am optimistic about the final outcome. The next step will be a review with Dr. Garlick on June 5. I am very pleased with the professionalism and personal care of Dr. Garlick and his nurse, Kaileigh and highly recommend their services. Learn about the Oxford Partial Knee Replacement from Biomet Orthopedics.